Summary: How will be the effects of the Deepwater Horizon spill? We cannot yet say. We don’t know the oil flow rate from the leaks. We don’t know when BP will plug the leak. But we can look at past leaks to help us forecast its effects. In general, large spills cause much damage but with minimal long-term effects (colder ecosystems recover more slowly). Doomsters ignore this history, preferring to rely on their fears rather than facts. How does the Deepwater Horizon spill compare to the largest spills since 1967? (1) How does the Deepwater Horizon spill compare to the largest spills since 1967? “Coping With an Oiled Sea“, Office of Technology Assessment of the US Congress, March 1990. Table 2-1 on page 4 lists the largest oil spills in 1967-1990. The Deepwater Horizon would be #49 on this list, having spilled, per official estimates, almost 6 million gallons so far. The Exxon Valex is number 35. 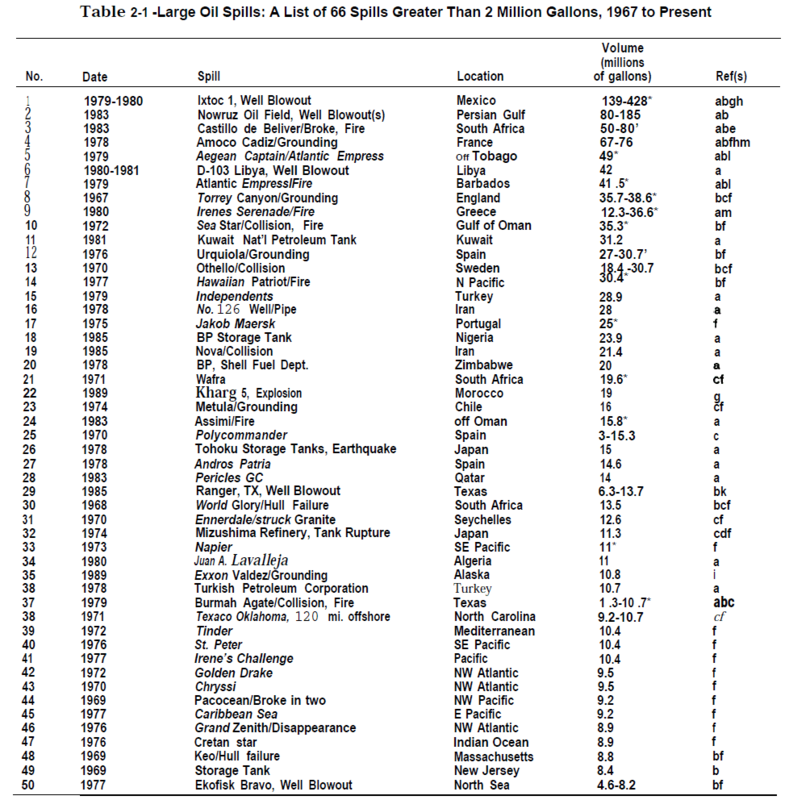 Where would the total oil spilled in WWII (thousands of ships sank, hundreds of tankers) rank on this list? Wikipedia has a more current list, in metric tonnes. This is the sort of data Wikipedia does not do well. Note that the estimate for the Deepwater Horizon is far greater than that of most experts. That so few people remember the IXTOC spill three decades latter gives a rough estimate of its long-term effects. Minimal. The biggest well-related spill was triggered on 3 June 1979, when a lack of drilling mud allowed oil and gas to shoot up through the 3.6-km-deep IXTOC 1 exploratory well, about 80 km offshore in the southern Gulf of Mexico. The initial daily outfl ow of 30,000 barrels of oil was eventually reduced to 10,000 barrels. The well was fi nally capped more than 9 months later. Mexico’s state-owned oil company, PEMEX, treated the approximately 3.5-million-barrel spill with dispersants. U.S. offi cials had a 2-month head start to reduce impacts to the Texas coastline. The blow-out of the Ixtoc I exploratory well in the Bay of Campeche on June 3, 1979, resulted in the release of about 475,000 metric tons of oil to the waters of the Gulf of Mexico. The authors calculate that approximately 24,000 metric tons of oil landed on Mexican beaches, about 4,000 metric tons landed on Texas beaches, and about 120,000 metric tons, or 25% of the total, sank to the bottom of the Gulf. Since thorough studies of the ecological damage in Mexico have either not been carried out or the results have not been released, the authors estimate biological damage from the spill on the basis of data in the literature, laboratory experiments, and experience with similar spills elsewhere. They calculate that some 15,000 km2 of the Gulf of Mexico can be regarded as poisoned by the Ixtoc I oil, although damage to lagoons was less than expected. The full extent of the damage remains unknown. … In terms of potential economic impacts, the most important consideration for Texas is the shrimp fishery, which represents over 95 percent of the value of landings . Evidence does not exist that indicates the oil spills affected the biological activity of shrimp or other important commercial species . Analysis is still underway that may reveal some evidence of potential long-term significance, but to date there is no biological basis for projecting a significant negative impact on commercial landings . Information gathered from industry participants and knowledgeable observers indicates that no measurable impacts occurred on landings or value of landings . While some small impact on fishing patterns was suggested, it was not significant in terms of measurable industry-level effects . Analysis of secondary data relating to commercial landings supports the direct observations obtained . Data for the study period, where available, indicate that commercial landings have been well within the range of natural variation . Brown shrimp landings, off considerably in 1979, are most plausibly explained by the predictable effects of unusual environmental conditions earlier that year . After considering natural variability, there is no evidence in the secondary data to indicate a decline in landings of any commercial species due to the effects of the oil spills . There is no significant direct economic effect of the oil spills on the commercial fishing industry of Texas measurable at the regional or major subregional levels . Additionally, there are no measurable indirect economic effects. that stem from the impact on the commercial fishery sector. This study clearly indicates that the effects in this case were of such a minor nature (at least in the shortrun) that no assessment using any reasonable amount of resources would have improved the ultimate estimate significantly . It further suggests that the decision not to conduct a large-scale primary data collection, relating to commercial fishing impacts, was appropriate . Hundreds of tankers and oilers were sunk during WWII — 333 identified in the Pacific (see #2 below). Many burned or spilled their oil when sunk. Many remain on the seabed still loaded with crude oil or oil products. There is little online research about the effects of oil spillage during WWII; the Campbell et al book is the most often cited. Impact of Oil Spillage From World War II Tanker Sinkings, Brad Campbell, Ed Kern, Dean Horn; MITSG 77-4, 1977 — No link found. WWII tankers typically were 5-20 thousand tonnes dead weight (max cargo capacity); tiny by today’s standards. Note that gross registered tons is a measure of volume. Few of the oil spills are closely monitored through EMSA’s CleanSeaNet equipment. In 2013, 215 satellite images were taken – and subsequently analysed – in Finnish territory. This is something to look into. Some years back, the Baltic Sea had something of a reputation as being a cradle for oil spills.The figures speak for themselves. According to statistics reported by the Finnish Environment Institute (SYKE), in 2001, a record number of 107 spills were reported, with each slick accounting for roughly 180 litres.